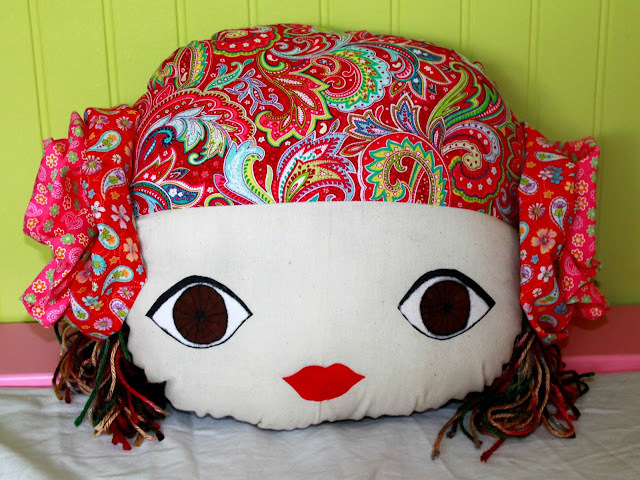 I saw this gypsy doll face pillow idea in a magazine and fell in love with the concept. I know there are probably others similar to this but I thought this particular design was too pretty to pass up. 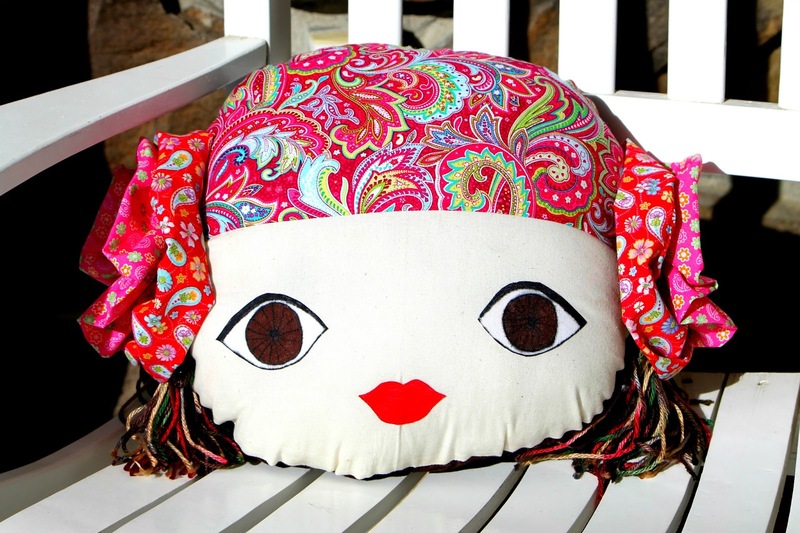 It’s the perfect beginner project that will make a stunning gift for a little girl. It can also be personalized to look similar to your child by changing the color of the hair, the color of the face fabric and the color of the eyes. The original design was created by Katrina Marie from KidsSewing.org. Please visit her site and enjoy her creations and lessons. I made two of these; one with pretty brown eyes for my little Mila and another with gorgeous blue eyes for her cousin. 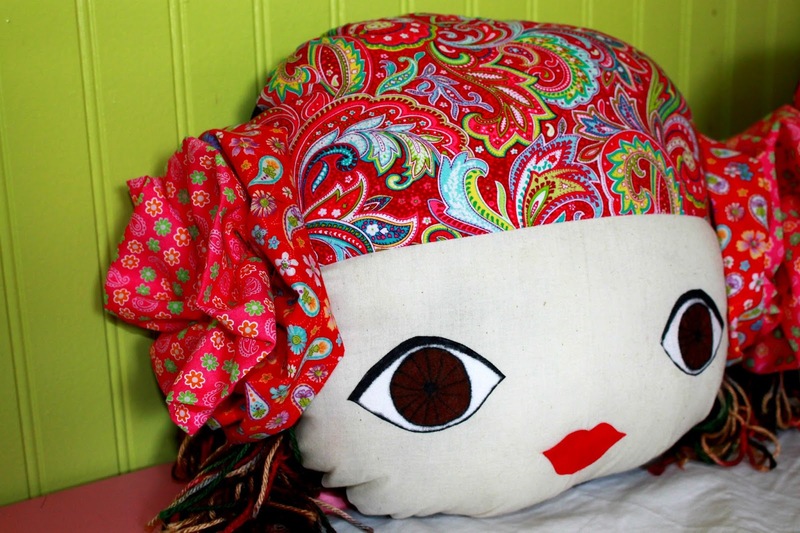 You can also use different fabric designs to fit the season or a specific theme. I personally think these would look best with contrasting colorful bright girly colors. I did bright red and pink for the top scarf and a complimentary bright color for the rosettes. This pattern is beginner friendly and the project can be done in about 1 hour or slightly more if you have a toddler pulling at your leg the whole time:-). 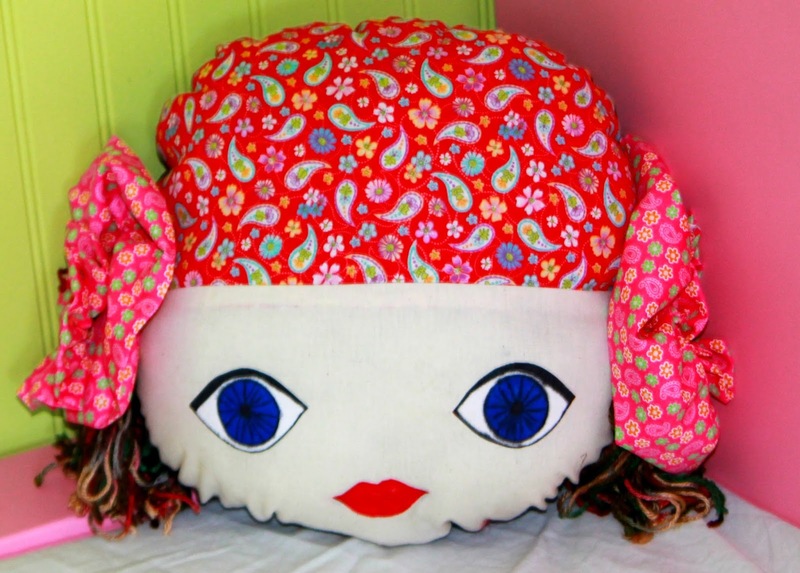 The entire project for one pillow cost about $15. Most of the expense came from the bright color fabrics. You can personalize the pattern by making it square instead of round, by changing the eyes, the height of the scarf, different options for the back etc. As we go through this tutorial, I will highlight the parts that you can personalize. 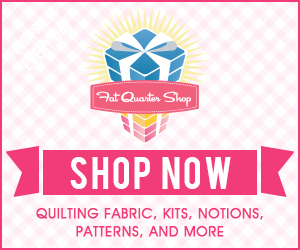 Download your pattern HERE. Cut out all your main pieces. From using the pattern, you should have 1 piece for the face, 1 piece for the scarf and two pieces for the back. For the outer rosettes, cut 2 pieces measuring 9” x22”. 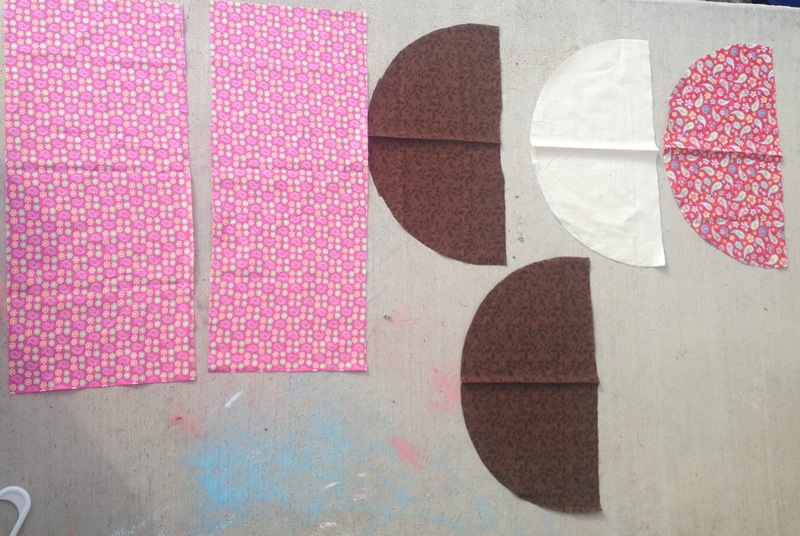 For the inner rosettes, cut out 2 pieces measuring 3”x 22”. The inner rosette pieces are not shown in the above picture. Lets work on the eyes and lip first. 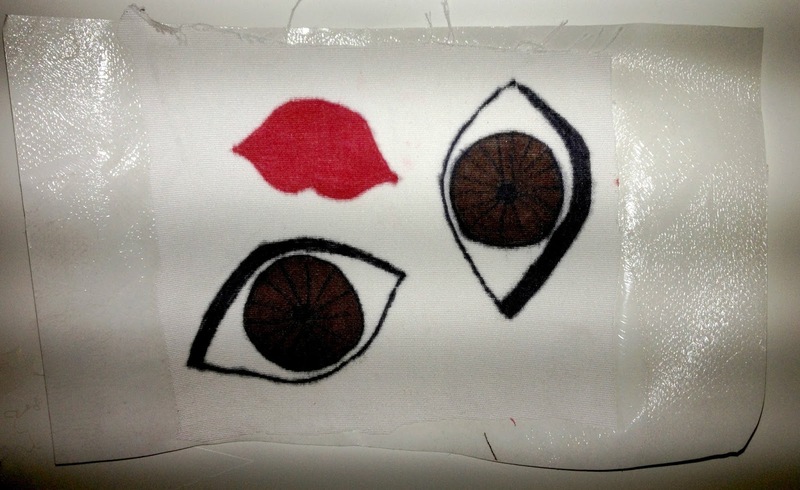 Lay one piece your white cotton fabric over the eye pattern and trace it onto your fabric using black sharpie. Color the iris with your color of choice. Apply your ultrabond interfacing on the wrong side of your drawing and iron on (read instructions on your interfacing). After its ironed on, cut it out and set aside. Repeat for the other eye. Remember to trace a mirror image so that you don’t end up with two left or right eyes. Now, remove the backing of the interfacing of your eyes and place neatly, following the mark on your pattern onto the muslin face piece. Do the same thing for the lip. The instructions in the magazine said to top stitch the lip and the eyes to the muslin but I didn’t think it was necessary after using the ultrabond interfacing. 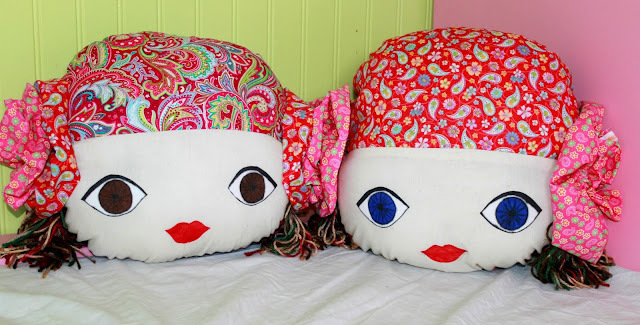 Remember if you changed the pattern by making the pillow bigger, you will need to relocate your eyes and lip pieces on the face accordingly. 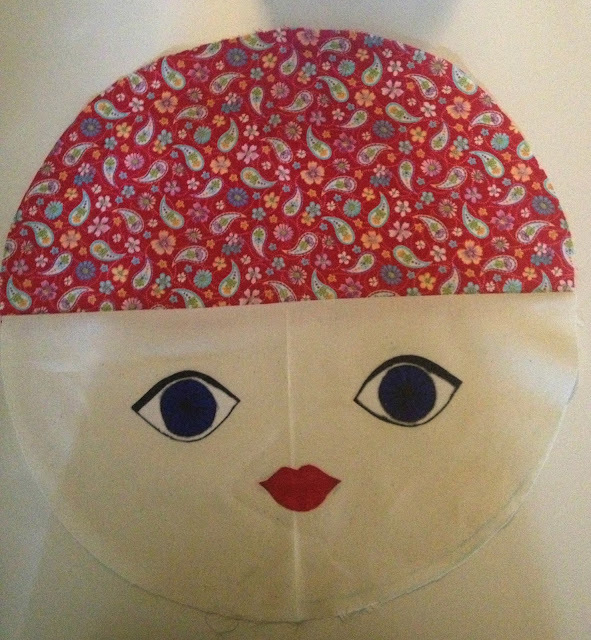 Next, take your face piece and sew it using ½ seam allowance to the scarf piece right sides together. Iron your seam pressing it towards the scarf. 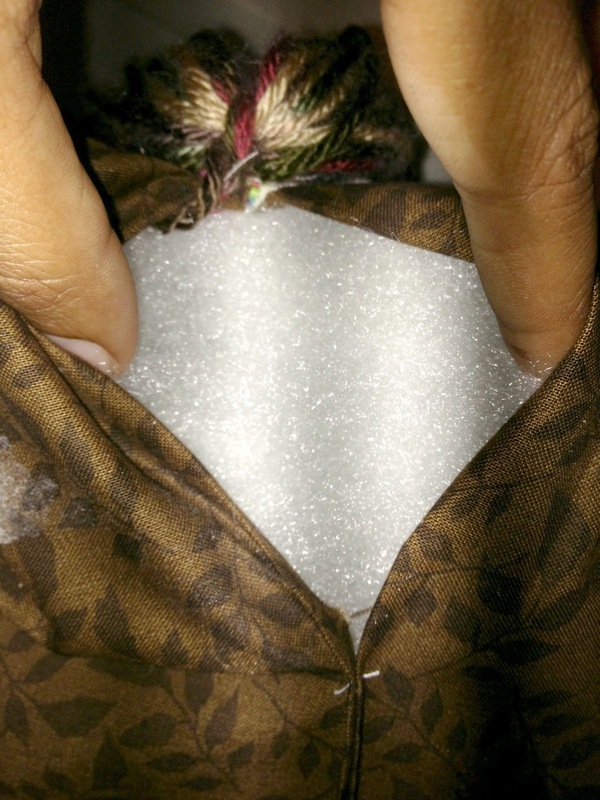 Now take your back pieces and fold it in ¼” on the straight sides. Set aside. 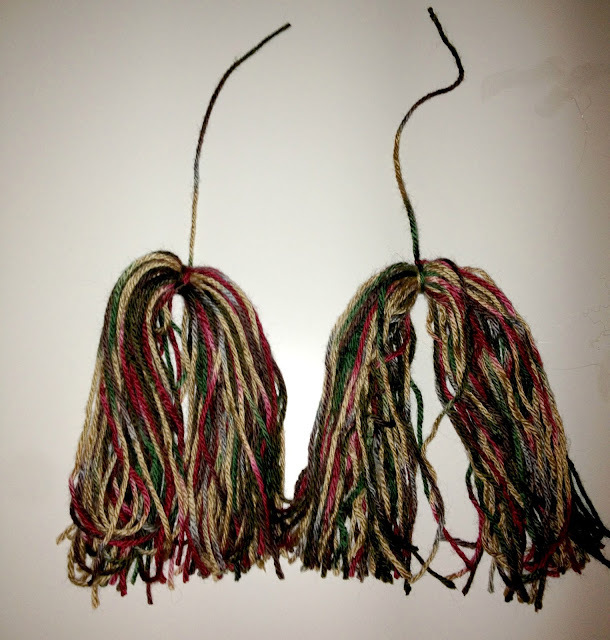 To make the hair, loop around your yard about 50 times in 10” increments. Sew straight through the middle of your hair bundle. Take one end of one of your loops and tie a knot in the middle of your bundle of loops making sure it is nice and tight. Cut out all your bottom loops to make both ends of your bundle even. To put it all together, take the end (closest to the middle of your hair bundle) of your loop you used to tie the knot on your hair and place it on the right side of front face piece where the scarf and face muslin intersects. Now, take one of your back piece and sew it on the front piece, right sides together using ½” seam allowance. You will be sewing over your hair loop when you put the front and back pieces together so make sure you do a few back stitches to secure it well. Sew in the other back piece. Turn your entire project inside out. Topstitch the back of the doll close leaving about 5” open to add your stuffing. Once you fill your face with stuffing, close your opening by hand sewing. I am sure there is a better way to do this but this seemed like the easiest way to me. Take your large strip and fold it in half lengthwise. Set your stitch length to the longest setting and sew all the way down. Gather the strip sew both ends together. Do the same thing for your small strip. Once you have both rosettes, hand or machine sew them together in the center. Now add your big button to the middle to finish the design. You can also add a fabric covered button as well. Once you have your button on, you can glue on your brooch backing to the rosette which will allow you to clip it to the side of the face of you can simply hand sew it to the face.